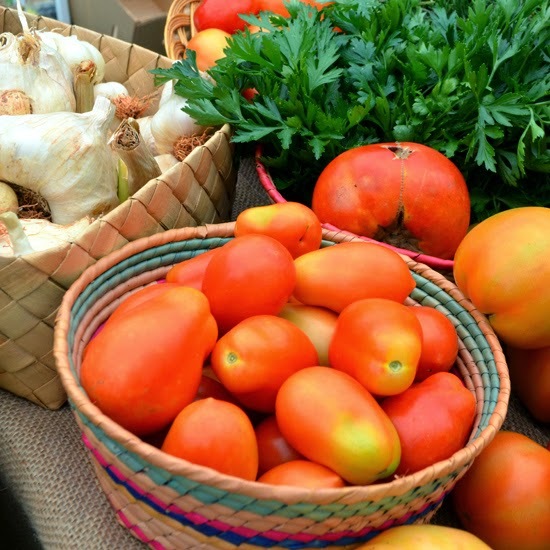 Why go to Grant Park Farmers Market? I have some fantastic reasons why! 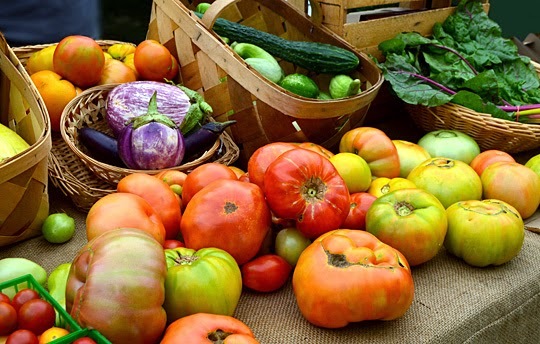 Listed below, in no particular order, are 10 reasons to visit the Grant Park Farmers Market, now a favorite of mine. I've noted before that, while not a typical tourist destination, I enjoy such markets when I travel, so I'm sure some of you do as well. 1. The Little Tart Bakeshop! I've not yet visited the brick-and-mortar shop itself, but have enjoyed The Little Tart Bakeshop's treats more than once...and O-M-G, they're good! And the ladies, and the dude, running the Little Tart tent were fantastic fun and super nice, which made my treat all the sweeter! 2. Peaches and blueberries—from Georgia! This galette was amazing! As was the strawberry one I had when strawberries were first in-season. 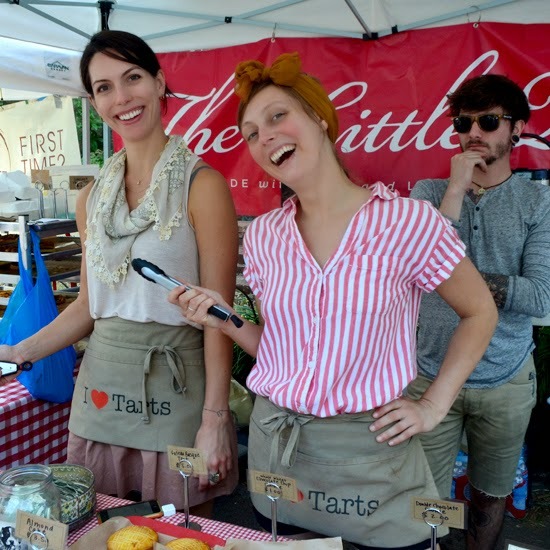 The Little Tart Bakeshop brings their "A-game" to every market I've found them in! Actually, Little Tart a guilty pleasure...if they're at a market, they're my first stop—even before coffee sometimes! 3. 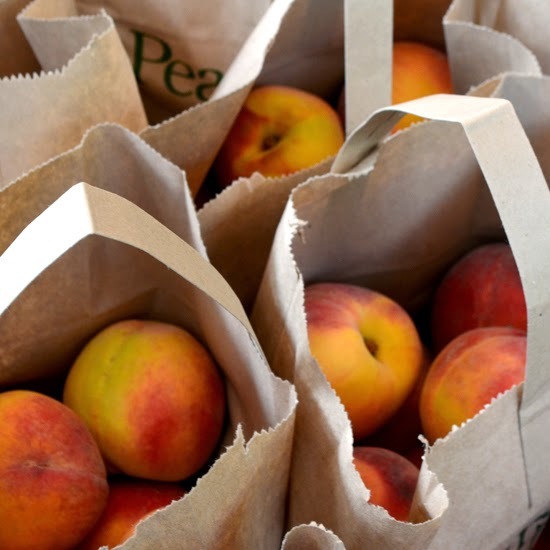 Just-picked peaches by the bag full! Fresh from the tree, these beauties are from Pearson Farm. I love, love, love fresh peaches! One of my favorite peach dishes is a Blackberry-Peach Crumble! Enjoy it warm with an all-natural, high-quality vanilla bean ice cream...delish! I got the Mighty Nut Quartet Granola and LOVED every bite of it. I enjoyed my Sweet Georgia Grains on various flavors of yogurt for breakfast over the next several days. 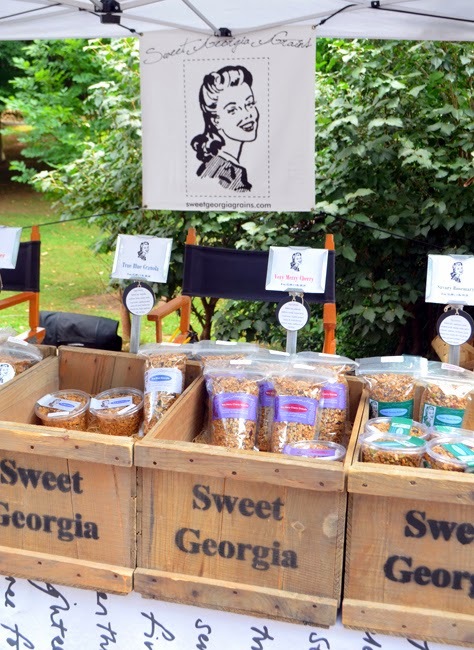 I think next time I'll enjoy the Heirloom Oatmeal Cookie Granola. 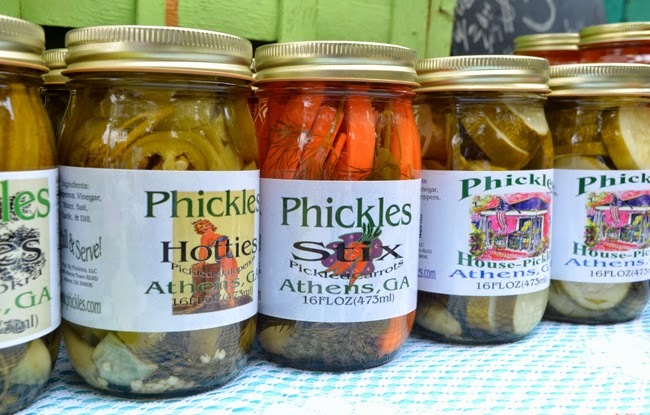 I LOVE pickles and Phickles has us covered...from "hotties" to "wedgies"! And these delectable small batch pickles are made right here in Georgia...Athens, to be specific. If you've not been to Athens, check it out...lots of fun there! Georgia's extra long growing season means fresh tomatoes for months and months! Ever had a tomato sandwich? If you haven't, ask a Southern friend who's in their 30s or 40s...they'll give a wide knowing smile and then be thrilled to tell you all about them! Or...you can learn about the beloved Tomato Sandwich from Chef Virginia Willis in this post. A traditional recipe, I also like lots of black pepper on mine! You never know what you might find at your local farmers market, but you can always count on the farmer being willing to enthusiastically tell you all about it. I've never met a grumpy farmer. So...why do you never see a purple bean salad? 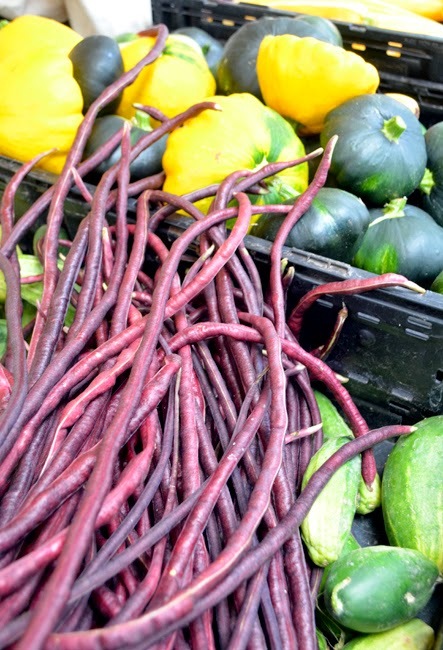 Purple beans change color when cooked. They turn as green as any green bean out there! Kinda cool, huh? 8. 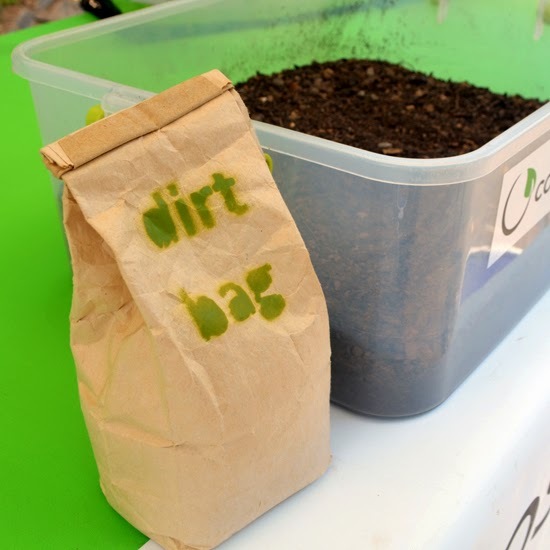 You can exclaim "Dirt Bag!" and not offend anyone! Well, you probably won't offend anyone. At least not those who are familiar with Compost Wheels, a compost pick-up service aiming to divert organic waste away from Georgia landfills. Kudos, guys! 9. All the great attractions within walking distance! First of all, you're in historic Grant Park, one of the largest parks in Atlanta. There's also the Atlanta Cyclorama and Zoo Atlanta, both in Grant Park! It was recently announced that the Cyclorama is moving to the Atlanta History Center, but I'm not sure when that's happening. 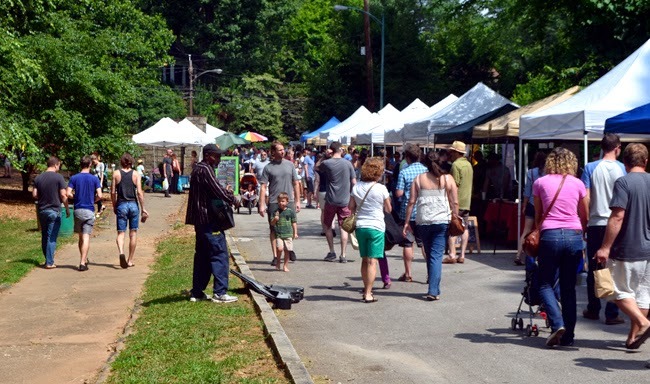 And if you're an adventurer, Historic Oakland Cemetery is walkable from the farmers market. Oakland is a beautiful Victorian-esque garden cemetery, and they offer quite a few tours. You can also do self-guided tours. 10. You get to meet real farmers! And be sure to thank them for what they do. I don't know about you, but the extent of my garden is a few herbs. I wouldn't survive on those very long, so I for one am grateful for the people to dedicate their careers and lives to growing the food I enjoy. 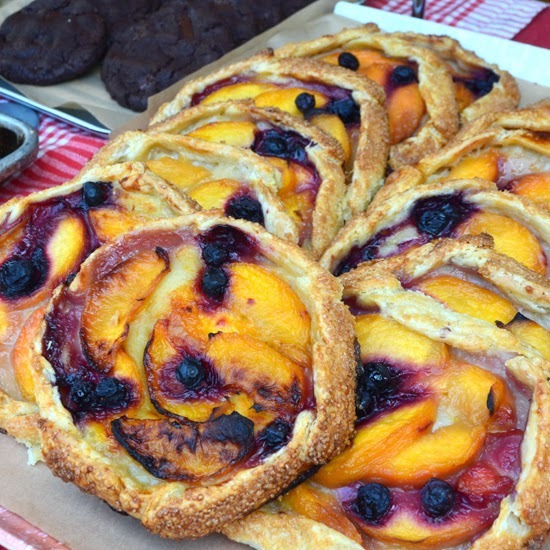 The gorgeous bounty in the above photo is from Freewheel Farm. There's a LOT more going on at the Grant Park Farmers Market than what I've noted here, but even that little bit sounds great, right? Check them out April through December on Sundays 9:30 a.m. - 1:30 p.m. Remember to thank a farmer!